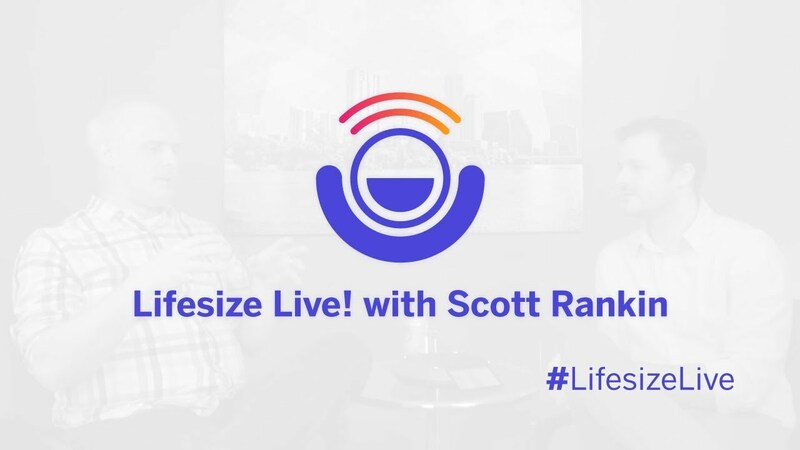 Hello, everybody, and welcome to Lifesize Live!, the live web show produced entirely through the Lifesize platform. I'm your host Julian Fields, and with me today is Scott Rankin, the global director of our sales engineering team. Scott, thanks for coming. All right, so we've got you online. I figured now would be a good time to answer a question that we've gotten a couple of times. People want to know about the setup that we have here at Lifesize Live!, so if you could, can you tell us about the solution that we've architected here? So from the gear we have in the room, we have the Phone HD, we have an Icon 600 as the CODEC, and of course the Camera 10x, which is capturing our video. We're streaming that out into the Lifesize service and then leveraging both our cloud-based recording service and our live streaming capability to deliver this live, over the webinar. We're using the same technology that delivers Netflix to your Apple TV at the end of the day, and we've got 54 POPs globally to deliver this at a low-latency high capacity on a global footprint to whoever happens to join us today. Gotcha. I guess the difference with Netflix is that they're able to buffer their streams whereas we won't be able to live. Yeah, I mean, they get a little more latitude being video on-demand, whereas we're live. And particularly with video conferencing, you're in a two-way dialogue, and it needs to be low-latency and real time, but the delivery mechanism for this stream is the same. We can handle an audience of about 10,000 people. Well thanks for explaining that. I know as the end user of the solution I walk in the room, I join the Lifesize Live! virtual meeting room, I hit “enable stream” and we're good to go. It's really simple, so thank you for all of your work in making that so easy. Yeah, I mean, I think it’s worth pointing out that you haven't spent the last eight years of your life as a sales engineer in video conferencing, and this is a very easy and approachable technology for you. I think that's important; that's a key element. So it’s a pretty self-contained little solution that we have here, somewhat different from our topic today, which is a more complicated, complex solution over Yelp. So you helped bring Yelp from an on-premise solution to the cloud. Can you tell us a little bit about the starting point and about their on-premise solution that they were using? Yeah, sure. So when I first got engaged with Yelp, their original state was that they had about 60 Lifesize end-points, they had our on-premises bridging solution, and they also had our on-premises sort of mobile desktop solution. At that time, that was what looked like a success back then. That was a lot of enabled rooms; it's a pretty big investment on their part for sure, they had the bridging capacity, and they had the mobile capacity with about 100 users on mobile and desktops. About 100 users on top of about—how many employees did they have? Well, today, they are right around the 2,500 mark. So you were telling me that, a couple of years ago, they reprioritized and rethought about reinvesting in video conferencing and making it a little bit bigger. What happened there? Well, I think the goal was to sort of—well, do two things, right? One goal was to sort of rationalize the different types of solutions into one platform that solved all their needs, and the other was to deploy a scalable, redundant, high-availability and mission-critical solution that could grow to all rooms and all employees. So when you look at it simplistically, there are two ways to accomplish these two things. One was to do it via an on-premises device. They had already done that, and the other way you can do it is to start looking at a SAAS type of solution. And that’s the reason I said, 60 endpoints and a bridge — it sort of looked like success. That was a reasonably big deployment back then from an on-premises perspective, and straying even further away from that presented some challenges. There's some fairly large capital outlay to get the kind of infrastructure you'd need to enable all the rooms and allow them to collaborate. So you've got that capital outlay and then you need to manage it, maintain it, keep it running, so there's a fairly significant management overhead. I mean, we've all seen those sort of on-premises architecture diagrams — it doesn’t really matter what the solution is, but you see a lot of servers and a lot of arrows. And I used to build those. I know making it work is certainly possible, and frankly, from an engineering and technology perspective, they're kind of interesting. But they may not be the most practical from an end user perspective both in terms of cost and managerial overhead. There are companies that grew certainly larger than that, but you're starting to talk about Fortune 500s that are past that stage of the game. And for this company, this is a team of four people who are managing this across Yelp globally. That’s a lot to do for a team of four people, which is why we started exploring the cloud space. Obviously, we've got the advantages of economies of scale — we can build that redundancy, and we can build that global footprint. More than 2xs it current capabilities, it sounds like? Yeah, 20xs technically. We built that global footprint that lines up with their office locations. And we've got two-way capacity with 20 points of presence for live video conferencing around the planet, with each one of those POPs with a capacity of roughly 600+ ports of high definition. So, I mean, what we're able to deliver architecturally, from a service perspective, is that it lines up with what their mission-critical goals and that we rationalize their solution. It's one vendor relationship you have to manage— we make the systems that live in the conference room, we make the applications that live on the desktop or the mobile phones and then we make and manage the service that ties all those things together. And we've got the support organization answering calls if something were to happen. So it's the full solution for them. Anyway, we've got two solutions at this point in our history. They chose the cloud solution — any particular reasoning behind that? Well, the one vendor relationship was a big piece. Another piece was they sort of had those existing endpoints and there was additional value, at least at the beginning. What we could give them was a little runway of getting more value out of those systems in terms of transitioning off to the next generation of endpoints. All right, so how about the actual transition? How was it being involved in that? Were there employees on the ground? How did we go about implementing that? Yeah, I mean, it's an interesting contrast. Back in the on-prem days, there were certainly boots on the ground because it was required. Today, there is some complexity around scale and some management required, but we have beyond the support team you mentioned — we've also got a success team that specializes in that whole adoption process, regardless of their size, from the starting point to wheels up and takeoff. So yeah, certainly there was work to do, but it was smoother and there was a little less heavy lifting involved. I mean, if you look at their weekly or monthly call volume, sort of at day zero they made about 1,500 calls on a monthly basis. But then there was a quick ramp up to about 5,000 on a monthly basis after deploying our cloud-based solution, and they're up to 10,000 calls a month. That’s about 300,000 minutes on a monthly basis, so it's interesting because that curve was certainly the result of the success team helping pave that adoption path. Watching that first initial ramp happen and then seeing it sort of build out over time has been satisfying, and it’s actually been a lot of fun. I mean, their initial state was about 100 users and definitely less than 300,000 minutes a month. It was probably measured in decimal points. Being here eight years — the first four focusing on on-premises solutions and the last four focusing on the SAAS world have just been amazing to me. To see customers achieve that kind of success and at that kind of volume, for various reasons — it's almost impossible in an on-premises world, right? Just from a cost perspective, managing that sort of thing is just fundamentally fantastic and fun. As a sales engineer, I’m seeing that Lifesize produces products and services that help that company run and how their employees work on a day-to-day basis. It's just as important as the phone system or the email system was, it's a video culture and it's fantastic to see that. I think one thing to point out is that this company dealt with big numbers, which meant they had a high adoption rate. But back to that concept of having 20 points of presence globally: you can get on this bus whenever you like, and we've got the capacity to scale with you. If you want to get up to 300,000 minutes on a monthly basis, that's fine — we can handle that. If your organization is smaller, that's fine too. But we'd like to be in every room on every desktop, and the more people you have on a collaboration solution, regardless of what it's riding, the more value you are going get out of it. And we've got the capacity to help you with it. I think that's kind of the moral of the story — whether you're looking at this little solution that I've got which is one endpoint and a cloud service, or Yelp, who has 300 end points and 300,000 minutes every month, we can do it all from Lifesize and you can help engineer it all. Yes! That's right, absolutely. I mean the one thing I can contrast is talking about the ability to scale. I mentioned we have global 20 POPs, so wherever you happen to be located, we've got presence to accommodate you. We handle over half a billion minutes of call traffic on an annual basis. So we've got the capacity to deal with any sized business.